Does improving energy efficiency reduce home insurance premiums? There are numerous ways to make your home more energy efficient. To start slow, you can replace old-school lightbulbs, separate your recycling properly, compost, use solar power for outdoor lights, and become ever-more-conscious of your water usage while observing peak hydro-periods. But what if you want to step up your efficiency game? Ontario has already begun to offer rebates to residents that make it easier for them to retrofit their homes and make them greener. But how does that reflect on property insurance? Insurance providers look at the improvements you’ve made to your home and whether they increase the value of your home and/or lower your risk to insure. With some energy improvements, you could be checking both of these boxes. Ever heard of SmartHome or Internet of Things devices? They allow homeowners to monitor their homes remotely and control certain utilities while they are away from their property. SmartHome technology has the capacity to reduce waste in heat, cooling, and water usage, which do in fact save you money on utility bills over the long term. You can save on your insurance by installing these devices in specific areas. They will require some sort of technological literacy to use but could stop your water pipes from flooding your basement in the event of a pipe leak or break by shutting off the water after a certain threshold is met. Some devices will even notify you of a vulnerability before it gets out of control. Insurance providers are beginning to offer discounts on these emerging technologies that eliminate wasted natural resources and notify homeowners of natural threats. In a way, controlling certain features of your home from afar can reduce your carbon footprint and save you money. You can even program your thermostat so you’re not using any heat you don’t need. Security monitoring features will save you the most on your insurance bill, if you were wondering. Additionally, devices that control lights while you’re away will make your house look occupied, reducing the potential for break-ins when your house is vacant. These are renovations and upgrades you can feel good about. They will also save you money over the long term, reducing your heating bills and energy consumption costs. Some insurance providers will offer small discounts (2% to 3%) to policies that include solar panels. The theory is that environmentally friendly homeowners are less likely to file a claim or be a smoker; they’re more conscious and responsible. 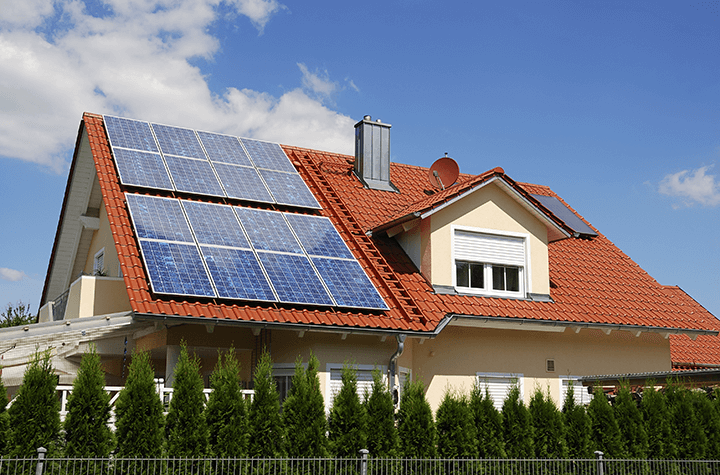 However, there are certain risks that are unique to solar roofs. Putting panels on your roof could actually increase your premium. The value of your home is also likely to increase. Since you’re putting a rather heavy material on top of your roof, you need to make sure your roof is strong enough to handle the extra weight load. Next, solar panels can actually impede and endanger firefighting should you experience a fire that impacts the roof. If you live in an area that is prone to storms or is surrounded by trees, the cost to repair and replace these solar panels is also considered high-risk by providers. One way to alleviate this risk is to install the solar panels in an area on the ground level, away from the home. Placing the solar panels in another sunny spot on your property has less likelihood of increasing your insurance premiums, and, you will still be able to take advantage of the small discount. Further, make sure you are hiring qualified workers to install the solar panels on your roof to minimize your risk of anything going wrong with the wiring or electrical charge components. In sum, investing in the future will bring unto you great returns. You can reduce your carbon footprint and eliminate unnecessary waste. The start-up costs will pay off over time, especially when coupled with the rebates that are available to homeowners. Solving heating and insulation problems in your home could save your up to 80% on your hydro bills, while doing something good for the planet. If you’re interested in going green, it is in your best interest to talk to an insurance broker to see which providers offer discounts for energy efficiency and/or Smart technology. When it comes to insurance, companies are still playing catch-up. There is still a lot of research to be done concerning how energy upgrades affect your home’s risk factor. Not every upgrade will lower your premium. Some might not even matter to insurers, while others may actually increase your rate significantly based on risk. The solution? Weigh your savings on energy consumption combined with the government rebates against the potential increase to your insurance premium. You know, that good ol’ pros and cons list. Do your research and talk to an insurance provider to find the right insurer for your green dreams.